So you have a sewing machine that your Great Aunt Elda gave to you when you got married (or you stumbled on a great deal on craigslist). You could be just starting out; only ever using it to fix some seams on some old shirts, or maybe you have lots of sewing hours in, making dresses for your daughter or even yourself. 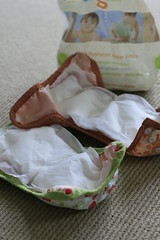 You find yourself saying; “It doesn’t look that hard.” when you look at a cloth diaper. Well, the truth is, it’s not… If you know the right terminology, that is. Being a pattern designer, my email is filled with questions daily: “How do I T&T?”; “Does this come with an insert pattern, as well as the pattern for a cover?”; “What’s the difference between inner fabric, outer fabric, hidden inner fabric, soaker fabric? How many of each do I need and where do they all go?” All of those are questions I actually just replied to from my inbox, and I will address them here along with a few others. Simply put the first T stands for turning and the second T is topstitching. Basically you sew the diaper right sides together, leaving an opening somewhere described in the pattern; turn it right side out, pin together the opening so it matches the rest of the edge and topstitch around. A turning tool (I use a bone folder, but a plain old chopstick works great) will really help the wings stay even when turning, so I highly recommend that. Does this come with an insert pattern, as well as the pattern for a cover? Mostly these questions come from folks that aren’t familiar with cloth diapering in general. Most of my diaper patterns include instructions for making All-in-One diapers (like a disposable), Fitteds (absorbent only, requires a cover of some sort), Covers (waterproof only, needs an absorbent inside. Can be a fitted, or even prefolds). For greater detail in descriptions of types of cloth diapers and add-ons (like inserts) check out http://www.zany-zebra.com/types-of-cloth-diapers.shtml. What’s the difference between inner fabric, outer fabric, hidden inner fabric, soaker fabric? How many of each do I need and where do they all go? All-in-One(AIO)/Pocket outer fabric: PUL or Polyester fleece works great. You can use Alpine, Blizzard or Anti-pill fleece from Joann’s for an inexpensive route (find coupons!) all the way up to Malden Mills 200-300wt Polartec works well. You can’t use wool as the waterproofing fabric, because it requires different care then the absorbant materials. Fitted outer fabric, AIO & Fitted inner fabric: Cotton, Hemp, Bamboo knits work well here. Fun prints for the outers of the fitteds are always a big hit with the kids. 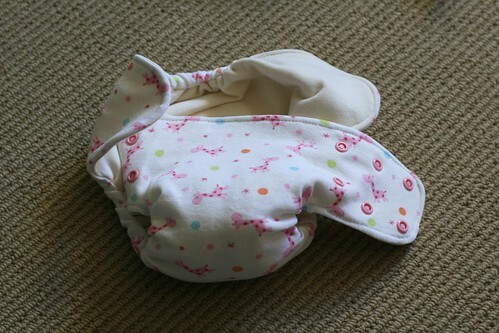 If you are going for the “I can’t feel wet” idea, which works wonders for overnight and outings, get some microfleece. Knits, such as interlock, jersey, velour, etc, will give you the largest range of fit. For frugality, it’s totally fine to go with wovens such as flannels and birdseye for full body layers (if you are using wovens and want the “I can’t feel wet” effect, try suedecloth), and pretty cotton quilting wovens for outers. Heck, while we are on the topic of cheap, search through old clothes, t-shirts work WONDERFULLY, and are found a plenty, look for natural fabrics and make sure you are using fabric with no more the 20% polyester content. Soaker fabric: This is where you get most of your absorbency from. Some folks like microfiber (towels in the car section) and zorb, others like french terrys and fleeces(cotton, bamboo or hemp here, not poly fleece! ), and others still like birdseye and warm and natural cotton batting. Try a few out and see what you like best! As far as numbers of fabric for each layer; there is a balance that you need to find between bulk and absorbency, for a “general average wetter” you should be fine with 3 body layers (outer, hidden inner, and inner) and a 3 layer soaker (microfiber, zorb, french terrys, old towels, lol, you get the idea) for the thicker fabrics or 6 layer for the thinner (birdseye, flannel, jersey) ones. Sew one up and see if you need more or less. For example, french terry is very absorbent and thicker then birdseye, but thinner then terry toweling. Birdseye is absorbent and about similar thickness flannel. Just a couple last things to remember when sewing your own. 1.) Ballpoint needles are your friend. 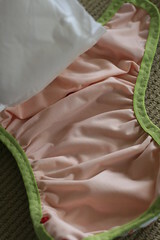 They don’t pierce the fabric they “push” the fibers away to go through, not causing runs (think those pesky stockings). 2.) 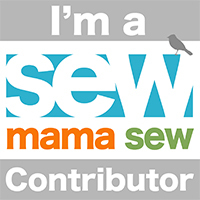 When sewing on knits, a stitch length of 4 or greater for a straight stitch is where you want to keep your settings. It will provide enough stretch so that when you pull the fabric, the stitches will move with it and not break. When I go on vacation, people always ask if I bring my cloth diapers with me. Well, the short answer is yes… and no. 😉 While I flat out refuse to buy disposables, mostly because of their lack of biodegradability, while out in uncharted laundromat territory, I do crave the convenience. Lucky, I found gDiapers. While I must admit I have never purchased a ‘little g’ pant, I have completely fallen for the plastic-free flushable diaper refills that gDiaper makes. 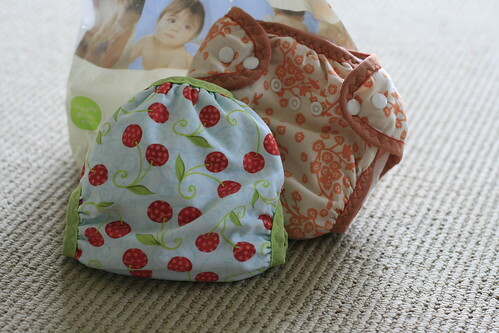 They fit PERFECTLY in the covers I’ve made with the Little One Size Diaper Pattern.